Wild Spirit Video Slot Guide & Review - Casino Answers! Wild Spirit is a 5-reel, 20-line video slot developed by Playtech, featuring a wild symbol, scatter wins, multipliers, a gamble feature, a free spins feature and a bonus game. You can play the Wild Spirit video slot at Bovada. Coin values on the Wild Spirit slot machine are $0.01, $0.05, $0.10, $0.25, $0.50, $1, $2 and $5. You can select 1-20 paylines and 1-10 coins on a spin in Wild Spirit. You can bet as little as a penny per spin up to the maximum total bet of $1000 per spin. Wild Spirit has an astonishingly large betting range that will suit any casino player, from low stakes to high stakes players. You can play up to 99 autoplay spins at a time. To play the Wild Spirit slot game, select your bet and hit the “Spin” button. To play with all 20 lines selected and 10 coins per line, you can use the “Bet Max” button to spin the reels. The highest paying symbol on Wild Spirit is the Stallion symbol. 5 Stallion symbols on a selected payline will win you the 5000 coin top jackpot. The Stallion symbol is wild and will substitute for all symbols except for the scatter and bonus symbols. The scatter symbol is the Squaw. 3, 4 or 5 Scattered Squaw symbols anywhere on the reels of Wild Spirit will pay out 5X, 25X or 100X your total bet. After any win on the Wild Spirit slot machine, you can press the “Gamble” button to activate Wild Spirit’s gamble feature. Click “Double” to gamble your entire win to double your winnings or click “Double Half” to gamble half of your winnings to win 50% more. Your goal is to pick a higher card than the dealer’s card on the left. You can exit the gamble feature at any time by using the “Collect” button. When the Chief bonus symbol appears on reels 1 and 5, you will win 5X your total bet and trigger the Wild Spirit bonus game where you can win up to 27 free spins with an 8X multiplier. In the bonus game, you will open Native symbols to collect free spins and multipliers. There are Magic Symbols which will open three more winning symbols. If you pick a symbol that catches fire, the free spins feature will commence. Triggering the bonus game during the free spins feature will award you with 8 additional free spins. You can use this special feature to win lots of cash on the Wild Spirit video slot at Bovada! Only the highest win is paid per selected payline. Winning combinations must be left to right, except for scatter symbols. Payline wins are multiplied by the bet per line. 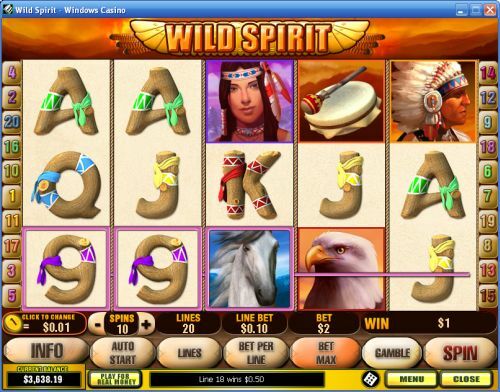 Wild Spirit is a very well done Native slot game by Playtech. It has a lot to offer, including good top payout, a bonus game, free spins feature and a gamble feature. It also looks great, which adds a lot to a video slot. You can play it for real money when you sign up and make a deposit at Bovada! Are players from the USA able to play the Wild Spirit online slot for real money? Unfortunately, American players are not able to play Wild Spirit for real money at Playtech online casinos. For those looking for a good Native American themed video slot, we recommend you play the Fire Hawk Video Slot at Bovada. Is Wild Spirit offered at Playtech Instant Play casinos? Yes, you can play a free Flash game of the Wild Spirit video slot at Bovada. You will be able to play it for free or real money. If you have any problems with the Instant Play casino, make sure you have the most recent version of Adobe Flash Player.